Kolkata: After shocking the Left by placing second in this week's assembly by-election in West Bengal behind the ruling Trinamool Congress, the BJP has launched a 'Mission Bengal' that aims at preparing the party to make major inroads in the panchayat or local elections to be held next year. The party is sending senior leaders to West Bengal to interact with workers as it builds its cadre in a state where it held no assembly seats till last year's election. Union Law Minister Ravi Shankar Prasad was in Hooghly yesterday, and today, Union Home Minister Rajnath Singh and Union Water Resources Minister Uma Bharati are in Kolkata and Howrah. The Kanthi Dakshin assembly constituency yesterday sent a Trinamool Congress legislator to the Bengal assembly again, but it was the BJP's performace that drew all the attention. The party placed second, ahead of number 3 Left by at least 30,000 votes. 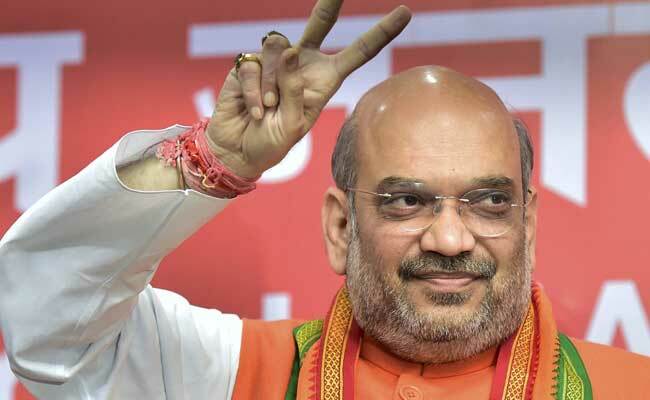 BJP chief Amit Shah and Prime Minister Narendra Modi tweeted special thanks to West Bengal's voters and Mr Shah declared the BJP "the principal opposition party" in the state. In assembly elections less than a year ago, the BJP had placed a distant third behind the Trinamool and the Left in Kanthi Dakshin, with only 15,000 votes and less than 9 per cent vote share. It has almost 31 per cent of the vote share this time. The Trinamool has improved its vote share by two per cent. The Left, which ruled the state for three decades before losing to Mamata Banerjee in 2011, has only 10 per cent of the vote share this time, while the Congress, main opposition for years, is a faraway fourth with a little over one per cent. Ahead of the by-election, the BJP and its ideological mentor the Rashtriya Swayamsevak Sangh (RSS) worked hard to expand the party's footprint in East Midnapore where Kanthi Dakshin is. The BJP's strong performance in the Trinamool stronghold is also being credited to its Ram Navami mobilisation. Union minister Ravi Shankar Prasad attacked Chief Minister Mamata Banerjee's government on Thursday, saying, "Ram Navami celebrations have happened peacefully everywhere in India. Why is it not happening in West Bengal? And why should you stop just one community from celebrating festivals? It's a total failure of the law and order machinery here." The Trinamool Congress said it was unaffected as the BJP has gained at the cost of the Left. "We are here to come first and between the first and second the difference is so huge that it does not matter who is second and who is third," said Trinamool General Secretary Mukul Roy. But the BJP leadership has made clear it is not in Bengal to play second fiddle for too long. The party, which had no almost no political presence in the state till a few years ago, first made an impact in the 2014 national elections. It won only two Lok Sabha seats, but increased its vote share in the state from four to 17 per cent. In last year's assembly elections in West Bengal, the BJP won four seats. The BJP is strategically working his way up in states where the party has not traditionally been a major player, building cadre strength at the grass roots and focusing on winning local elections. After a strong performance in local elections in neighbouring Odisha this year, the BJP chief has announced that his party's next target is forming government in that state in 2019. The party has chosen Odisha capital Bhubaneshwar to hold its next national executive meeting starting tomorrow.